Being a Wedding Photographer in Cornwall is truly exciting. You never know who is going to be in contact next and what ideas Brides to Be have about their wedding plans. Many of the Brides I photograph do not live in Cornwall but have been to Cornwall on holiday and have decided that Cornwall is the place to get married. Many bookings are completed after telephone calls and emails before I have met up with Brides and their Grooms. It's great to work with "my girls;" always good fun and from my point of view a thrill to be involved in such an important occasion. Some of the wedding venues in Cornwall have facilities for outdoor wedding ceremonies, which are very popular. You can have a blessing on a beach provided the legal side of things have been carried out at a registry office prior to the beach blessing. You will need a bad weather plan in place just in case. I photographed such a wedding on a beach some years ago; fantastic! A popular part of weddings in Cornwall and one of the main reasons couples choose to get married in Cornwall is a visit to a beach. In addition to providing some of the most beautiful backdrops for their wedding photographs, it gives couples a chance to share some quality time together. 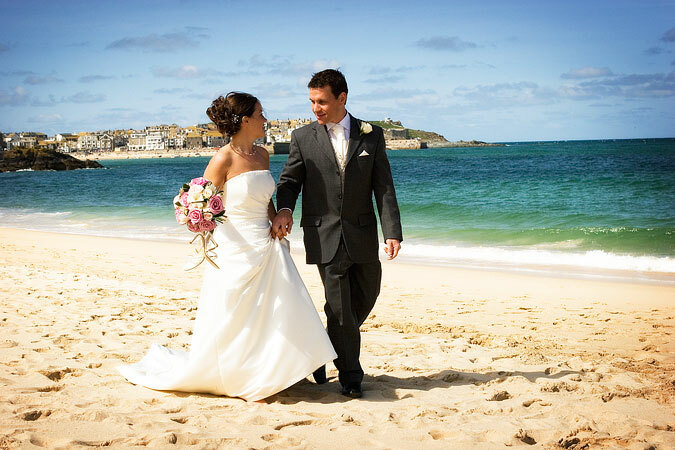 Many of the weddings I photograph take place near St Ives which has some fabulous beaches nearby and easy to get to. This is a perfect time to capture images that will always have a very special place in every couple's memory. A stroll along the waters edge as you walk bare foot, feel the sand between your toes, hand in hand, stop, enjoy a cuddle turn to each other and savour these truly special moments - moments that will provide great photography opportunities. Most of my Brides like the photography to start from the final stages of getting ready and go through to the first dance, although I have started as early as breakfast through to fireworks. It is a long day but it's amazing how quickly the time flies by. Many of the weddings in Cornwall I photograph are smaller gatherings as guests also live outside the County and often combine a few extra days down here for a welcome break. In general guests tend to stay at the wedding venue on the wedding day and enjoy a relaxed evening celebration.